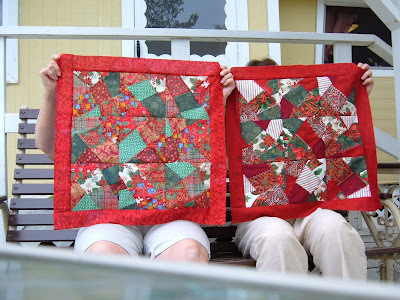 I have never been part of a quilting bee-you know, the old fashioned sit around the frame and hand quilt with other women kind of quilting bee---->until today! Mom, neighbor Millie and I went and had the time of our lives. Many of the other women hadn't done hand quilting either so we were guided along by one of the more experienced members. Mom and I had read about quilting bees so were able to share this first for each other together which made it all the more special. It was all we had hoped it would be! These ladies are finishing the piecing on the girl's quilt and then they are going to mount it on the second set of frames so it will be ready to quilt when we are! Next week I will be in Georgia visiting my daughter and family so I will miss the weekly session but since there is another crib-sized quilt that needs doing , there will be more gatherings for me to participate in. Since most of these ladies are neighbors of my Mom, she is going to go while I am gone-that's the way , Mom! 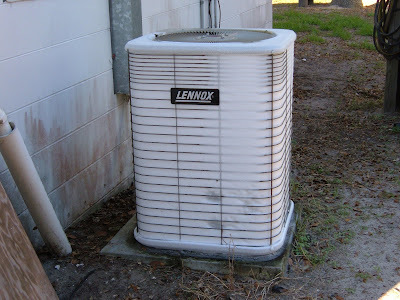 This is our ac/heat unit-all frosted up this morning-the heat wouldn't turn off and Bill found out why! No, we don't know why it frosted up but a visit to our neighbor who used to be and AC guy should clear up the mystery. 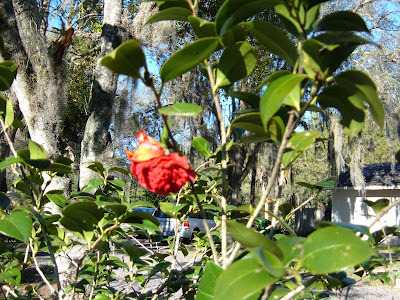 Now the sun is up and warm already; 60 degrees from the 34 of 3 hours ago so it shouldn't be long before it thaws! 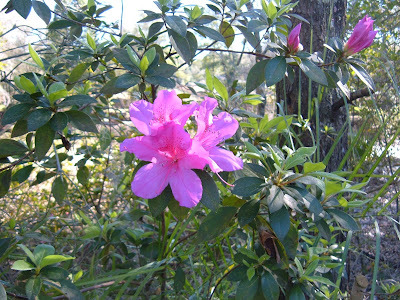 ..........azaleas around the yard and especially all down our driveway! I have already made plans to swap some shoots with a friend when these are done flowering so we can both expand our selection of colors. 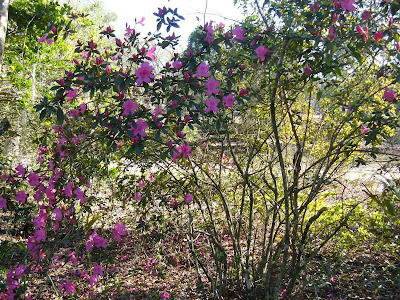 Our bushes should continue to bloom well into April so we will enjoy the show for now. 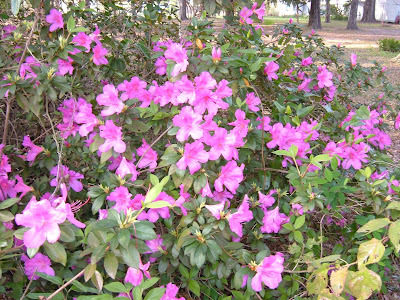 I presently have this florescent pink, light pink and white blooms in my yard. Since she doesn't have any whites she is willing to trade so I may have some of her red and coral plants-we are both happy with the planned exchange! I have special plans after lunch and if all goes well, will be posting pictures later today-I am hoping to participate in something I have never done before! This is what Mom's table looks like when we designate a sewing day! We have a cutting mat on one end of the table and the other has our ironing station-we share pretty well! Today we made small wall quilts for Christmas time (hey, we are together now and won't be at Christmas!) 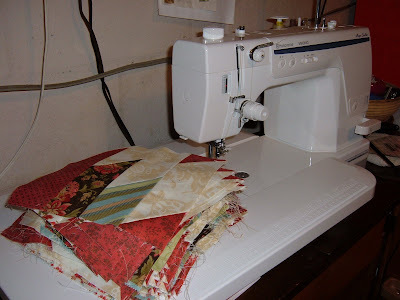 It was a loose rendition of the Caveman style quilts I saw on Simply Quilts recently-a stack 'n slash style of quilt-very freeing to do because there were no seams to match when piecing each block; it has the look of a crazy patch and we decorated a few seams with decorative stitches on our machines. Chocolate was a nice perk to each mile-marker (like finishing cutting, or sewing a section, etc.)! We have to finish layering and quilting each wallhanging for homework but here is what we finished. 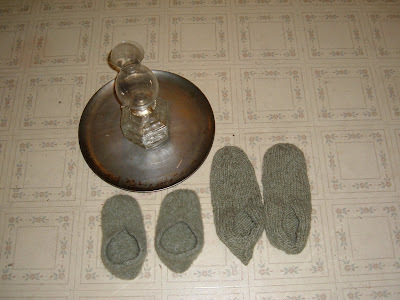 This is what I was knitting, and while the power was out, I finished the second pair of felted (really they are fulled) slippers. One pair is for me and one pair for my neighbor Millie-she wore through here first pair 'cuz she wears them all the time to give her feet some cushion on her ceramic tiled floors! I am going to try to put silicone caulk on the bottom of these to try to make the soles last longer. Will let you know how it goes and if they last longer! This is a new-to-us game called Spinners. 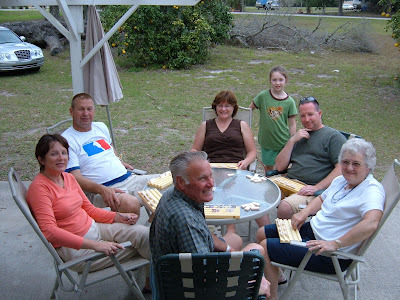 It is a domino game that only includes the math when you have to add up your tiles at the end of each hand. We had a lot of fun but generally need little reason to share laughs in our family! Little sister and family left this morning. My daughter and hers left yesterday...goodbyes are so hard. But......hellos are nice and I have one today from my youngest son. I hit the cooking trail-big dinner, cookies and rolls are all standard visit fare for him. I don't love kitchen duties but I do love to do what pleases my guys and like their father, food is important! At least in this home, the kitchen is open to the living area so I am not cut-off from the visit while I am cooking-makes kitchen-time family-time, too, and that I love! As far as handwork goes, this is what I knit in the few spare moments over the past week or so. 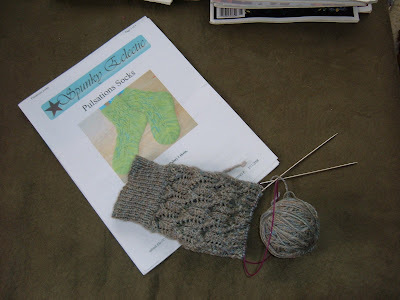 It is the hand spun merino/silk blend and it is the first in a pair of socks. 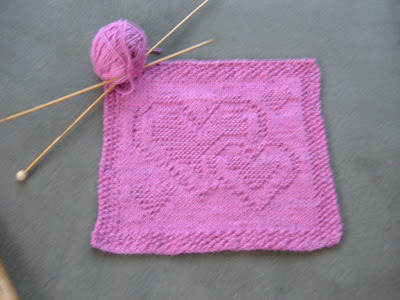 It is a nice pattern but just enough counting so that I can't knit while in a crowd! I didn't mind less time knitting when I could replace it with family time. 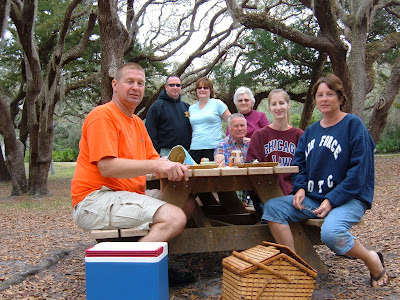 Off for a picnic today-it was overcast but mild (71). 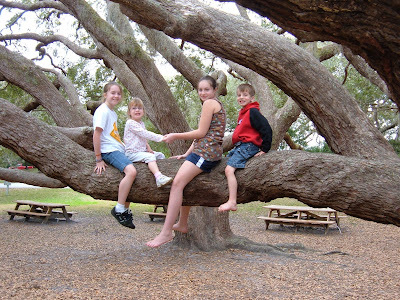 We stopped at Montanzas fort for a picnic and the annual tree climb picture-we have pictures of our 4 adult children in this same tree and even some friends that accompanied us through the years.............it is an important tree to our family! 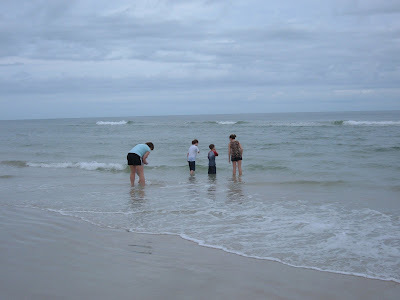 The kids took right off for the water at the beach-the water was cold to me at 66 degrees but they plowed right in-jumping waves and squealing-beautiful to behold. Even Abigail wanted in right away-Marsel had to make a quick scramble to remove hearing aids and she made it just in time-David said not to worry-he had them safely in his sweatshirt pocket! Never a dull moment! 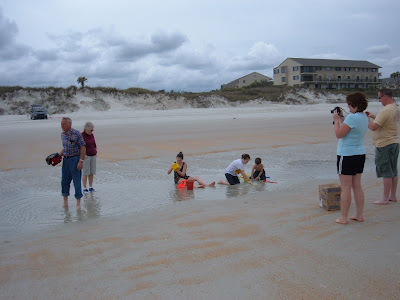 We found that the tide pool was a bit warmer and calmer to play in and we settled round with cameras to catch the smiles. Note my mother's proper foot apparel for on the beach-bare feet give her the willies and on the beach this is especially true! 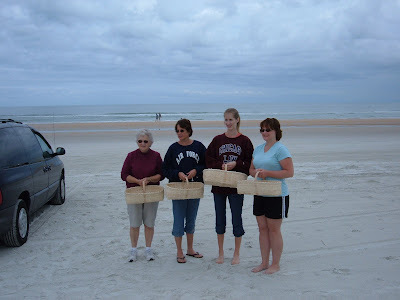 Every year we plan a project to do together and even Con joined my Mom, daughter and I this year in weaving a basket. This was her first and she took right to it like there was Native American in her (there is!). We worked on this most of the day and she even finished hers first! 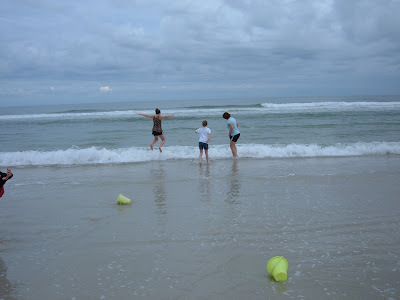 What a satisfying time-thanks to Amanda and Alicia for keeping the kids entertained and in check so we could do this. Bill and Chuck went to play a round of golf and got sunburned and laugh lines to show they had a good time. 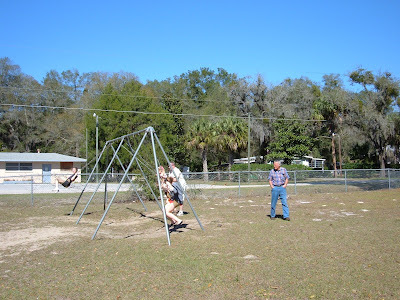 We enjoyed a tramp to the park just down the road from my parent's home. The kids had fun chasing each other around and getting their picture taken-unlike the adults who all scatter when the camera focuses on them! Grandkids and neices and lots of laughter fill the rooms of my home. My daughter is here with children to visit her aunt and uncle while they visit at Dad and Mom's which is just 2 miles down the road.................so nice to have a full family gathering. 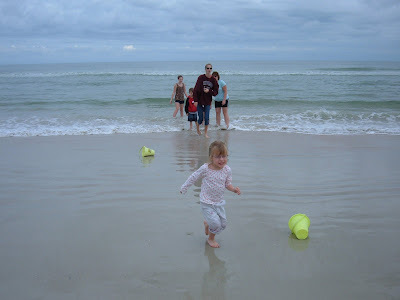 The kids play nonstop all day and go to bed very easily at night! 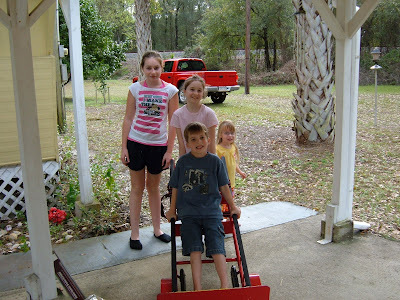 We recently moved refrigerators around and so the kids think that we have this moving dolly just for their fun! 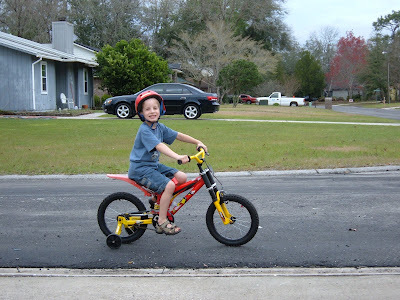 Today we visited a friend, Jessica, who used to live in NY, and we enjoyed watching the children play together-especially the boys on all the bikes! Abigail preferred to watch and so didn't get in the photo. My sister, brother-in-law and 2 neices arrived this afternoon, seeking succor from the brutal weather of Central NY. 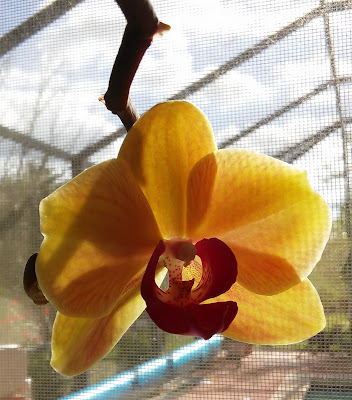 We greeted her with 80 degrees of sunshine and a light breeze that caresses you instead of knocking the breath from your lungs! 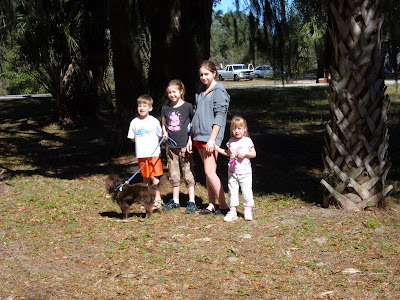 We enjoyed a tour of my house and and yard, then to Mom and Dad's (where they will be staying) for dinner. They drove straight down with only a few naps along the way-24hrs-sleeping horizontal while holding still will be a treat tonight! I knit 2 of these while waiting for my sister and crew to arrive-it is hard to see clearly but it is a palm tree design on another dishcloth from Ravelry KAL. I dyed the yarn for this, too. The green is a lighter shade of sage than I wanted but cotton is harder to get the accurate shade as I use the acid dye I use for my wool. It isn't white ,so it is okay with me. This is my Mom's work of art. She has made this for a friend who admired a similar one in a craft shop. It has been fun to see it take shape on our sewing days. 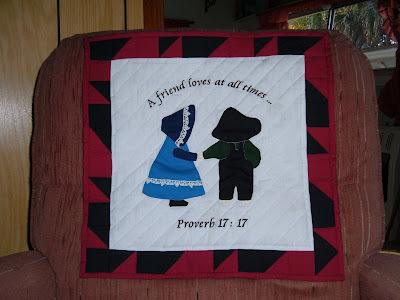 She did all the piecing and quilting on this 24" wallhanging on her Husqvarna Viking Lily. 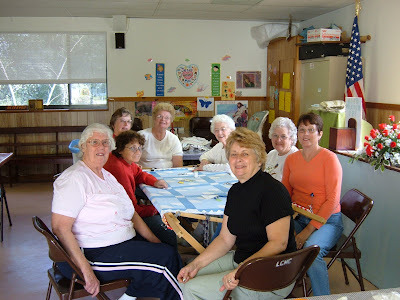 We met a nice group of ladies at a church group where Mom attends here in FL. 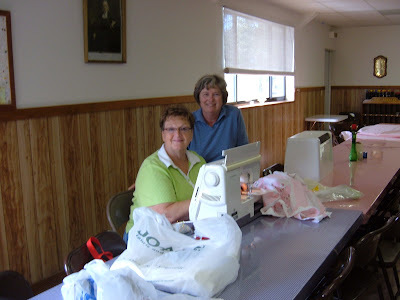 They had invited her to their charity quilting-they welcomed us like long-lost friends and we had a nice time handsewing some dresden plate blocks together. I will be sharing more from this group as they meet every Friday and we have been invited back! 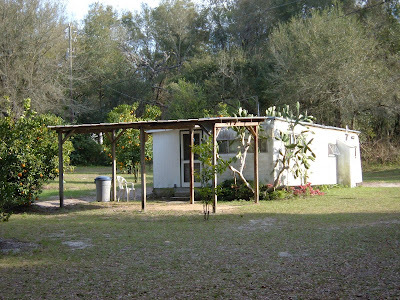 I added pics to the old post (Feb 12) about the trailer Jim Millis is staying at if you want to go back and see them! Thanks! 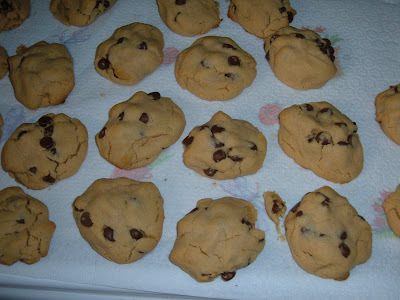 Will get back to the cookies I am making...wish I could share some good smell with you! 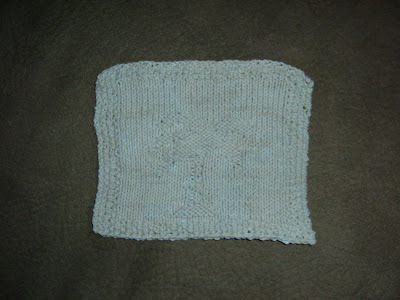 I found this pattern from Ravelry's website (an online universe for knitters) with the Dishcloth Weekly Knitalong group. My daughter had given me a cone of Sugar 'n Cream cotton yarn but it was white-out comes the dyepot and I dyed two skeins, one I gave to Mom to make one also. A visit to her to share my finished work didn't produce such happy results on her dishcloth-somehow in the day she mixed up the right side/wrong side and had a half and half dishcloth--she immediately began to rip-that is where I get my fearlessness from-she will finish it today instead! Good for a laugh! 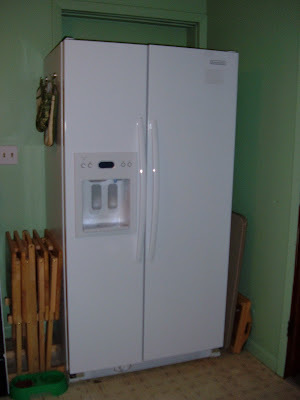 Last night Mom called to say her fridge went from inefficient to unable and so Bill and I went today to purchase our new fridge to be able to pass down our smaller one to Mom and Dad (since they are only here for 3 months a year this only makes sense. Off we go to shop-find the fridge at the first store and then proceed to visit all other 5 stores to be good it is the right one at the right price..........early in our marriage this was a cause for misery, now I understand it is a compulsion for my husband and he is in pain if he doesn't comparison shop. I bring my knitting and sit in the car while he continues to go into all the other stores. He is grateful that he can look and I am grateful I do not have to-there is a confidence that is reached after 32 yrs of marriage that is a welcome place of rest. Anyway, we brought the fridge home and emptied, cleaned the old one, moved in the new and stocked it right up-sure does eat up all the space but since all the drawers pull out, we will no longer have to kneel and dig to find things anymore! Some wives have to content themselves with flowers on Valentine's Day but I have a new fridge and a shelf of chocolate! This is love! PS - A big thanks to Mike Gritzke , my Husqvarna Viking Dealer in NY state (and to my family aka sewing-machine-Mike) for telling me about Gel Gloss, an appliance cleaner/polish which took all the nasty sticker residue off my new fridge and left a beautiful shine that will resist the prints left by hungry hands! 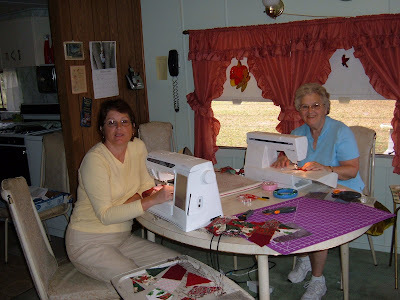 Every week Mom and I get together to sew. She has made 2 wallhangings and I have been making the same quilt that Tom helped me with on a previous post. Well I finished the 80th block today on our sewing day. When I got ready to take the pic, I noticed that I had sewn the last one wrong! Out with the seam ripper and then I inspected the rest of the pile-no more surprises unless I sew them together wrong in the layout! This is a kit from Hancocks catalog and the colors just thrill me. Will be laying them out and arranging them when DD visits next week. I mention my neighbors when I talk about their goats, but the mister is a master woodworker, too, and he has offered to be my teacher whenever I want. I took him up on the offer and had a wonderful day and learned so much! We are both strong-willed creative people and so had to find the place where I could share my vision enough for him to make it happen but we did it! Has anyone played this game-Wahoo is the name; when I googled it, I learned that it originated in the hills of Ky/Tn. It was brought to my rememberance when I recently read a book about the Amish and they mentioned playing this and it woke up a long ago memory. 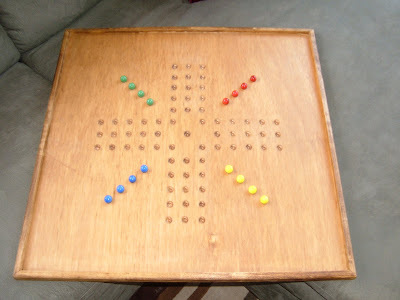 I called Mom and she said the game we played so much in my growing-up and teen years was still there but the original marbles had been scattered. She brought the board down to FL and we have been having a blast playing it. (I purchased some marbles from EBAY) After a day with some serious router work, I now have my own masterpiece! 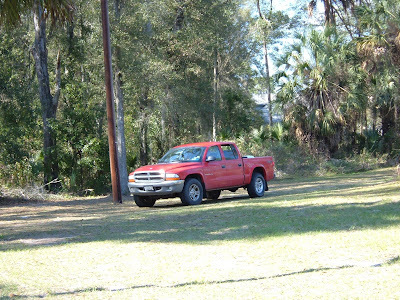 Bill has been working for 3 weeks now to overhaul a small trailer just a few miles away that we also own to get it ready for another northerner to winter here. (The northerner is Jim Millis who is a fellow NiMoBro, retired and likes to escape the winters of Tully , NY.) I was ready to torch the building but Bill has perservered and it is finally looking good. I am usually the one with vision about these things but he has really surprised me this time in a good way! It just needs a good coat of Sherwin Williams paint (2 sons work for them!) on the outside and it is finished. 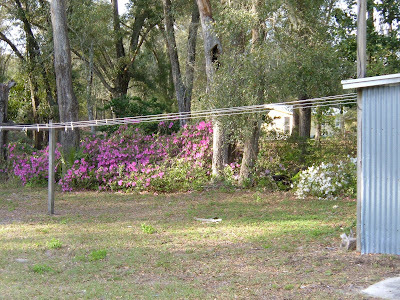 This is the trailer side yard........see the pretty azaleas-a whole hedge of them-beautiful! I have been sewing on the State of Grace quilt-60 of the 80 blocks are now made (see prev post with Tom sitting on it). 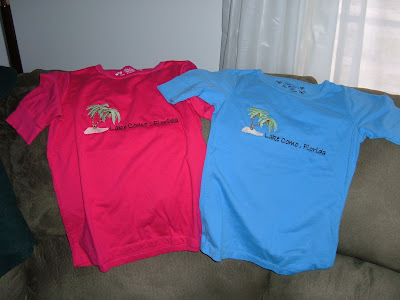 Yesterday I worked on these souvenior T- shirts; we are not in a tourist area and they do not sell shirts with a logo for our small communities around here so Mom bought the shirts and I logo-ed them for my neices who are arriving Saturday afternoon , if all goes according to plan, and they will be able to go home with official 'I have been to Florida' t-shirts! SHHHHHHH! DON'T TELL THE GIRLS, IT IS A SURPRISE! I have had a request from my Grandson to make him a vest but this time he wants sleeves! 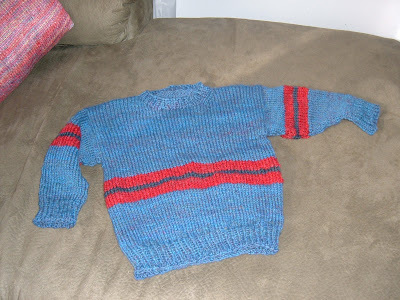 I have spun and knitted several vests for him in years past so I love his way of asking for a sweater this time! This yarn is Ashland Bay blue corriedale fiber, spun worsted weight; the red is some camel fiber leftover from a previous project. Good thing I broke up the stockinette with the stripes 'cuz I just barely made the last sleeve with only a yard of yarn left! This is a pattern I made from The Sweater Wizard program which I love because it allows me to plug in a growing child's measurements and get perfection every time! I love to knit from the top down without seams-so it was a dream to knit this-now I am looking forward to a visit soon so I can share it with him!